Do you remember the old children’s song, The Farmer in the Dell”, how the farmer takes a wife and the wife takes the child and the child takes the cow, and so on, until you get to the cheese, and the cheese stands alone? 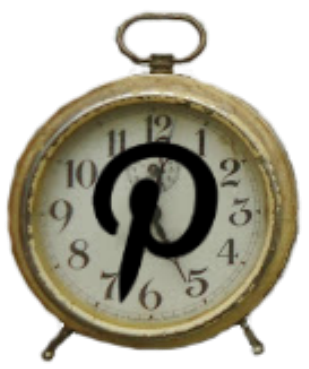 Well, for whatever totally random reason, writing this post reminded me of that poem, because one thing led to another and another and another. At the end, you’ll see what “stands alone”, like the cheese did in the song. So…I picked up this cabinet for $4 at a thrift store several months ago. It’s been hanging in my entryway, looking tacky,but I needed more storage for small paint cans and this worked. Then we I decided that we my husband should remodel the entry way, so while he started tearing apart this wall (beginning stages seen here), I decided I wanted to make the cabinet look like a farmhouse cabinet for my kitchen. 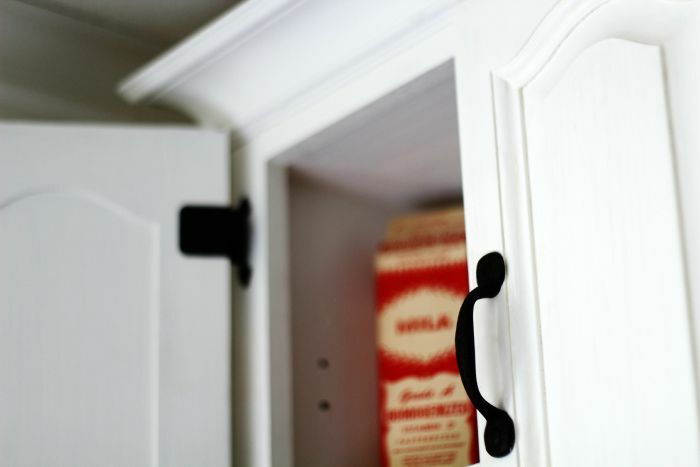 You may recall that when we remodeled our kitchen, I opted for open shelves, instead of upper cabinets, which helps the kitchen look more open and spacious than it really is, but the thrift store cabinet is small enough that I knew it wouldn’t detract from the open look. 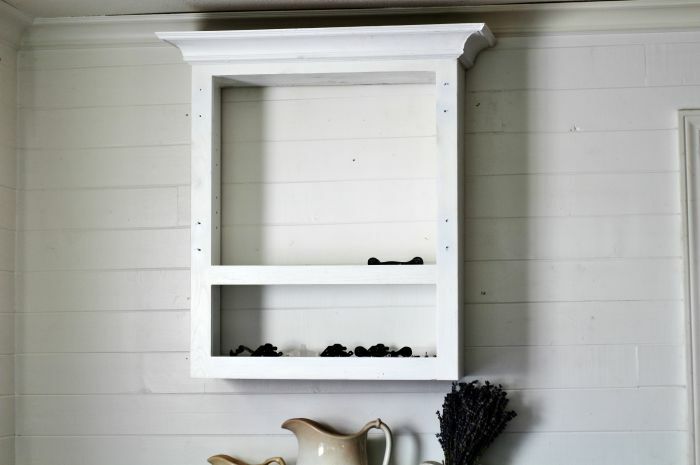 I removed all the hardware and I talked my husband into taking a break from working on the entryway, to attach some leftover crown molding to the top, then I painted the whole thing white. I didn’t want to use the knobs that were originally on the doors, so I bought rustic drawer pulls by Hickory Hardware (affiliate link) to use instead. 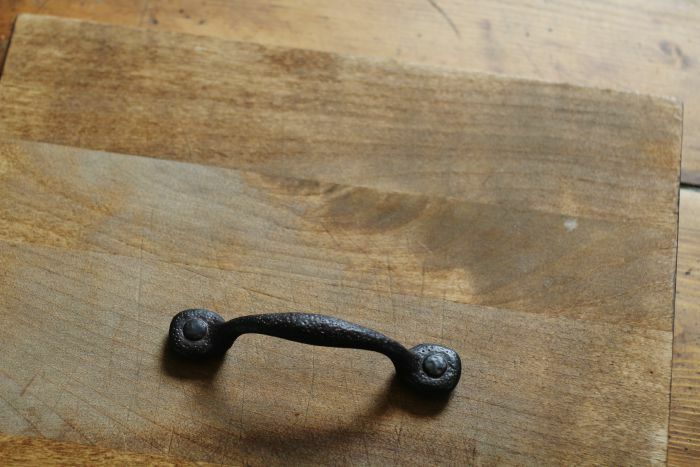 These are the same pulls we have on the drawers above the lower cabinets in the kitchen. I kept the original hinges and just spray painted them to match. Here’s how it looks with the doors back on. Although I may use it as kitchen storage, for now I just wanted to have fun decorating the inside of it. The cutest old milk carton went in first. I found it last week at an antique store, and had to have it. Then one of my old pretty platters and one of the “sisters” in my ironstone pitcher collection were added to the vignette. Then I decided all the rest of the sisters in the family needed to be added too. I have lots of different sizes of pitchers, from a mini creamer size, to a very large one. 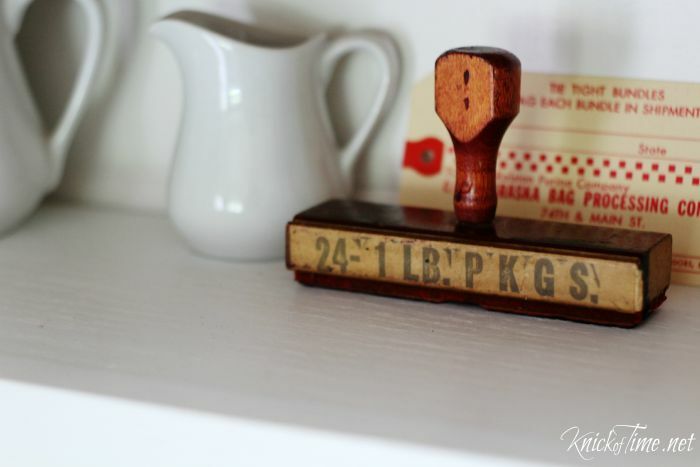 Tucked in next to the mini pitcher is an antique rubber stamp I found at another antique store a few weeks ago. 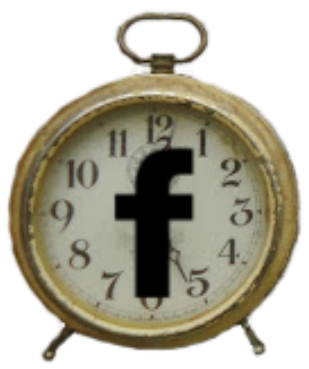 Originally, I thought I would sell it in my shop, but I just couldn’t part with it. 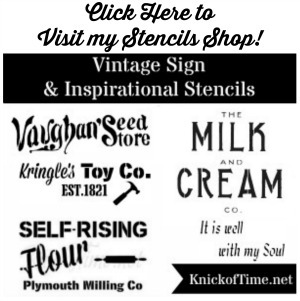 On the lower display shelf, which the doors don’t cover, is my favorite upcycled tin can, that I put an antique can label on (printable (here). I love that cow image! 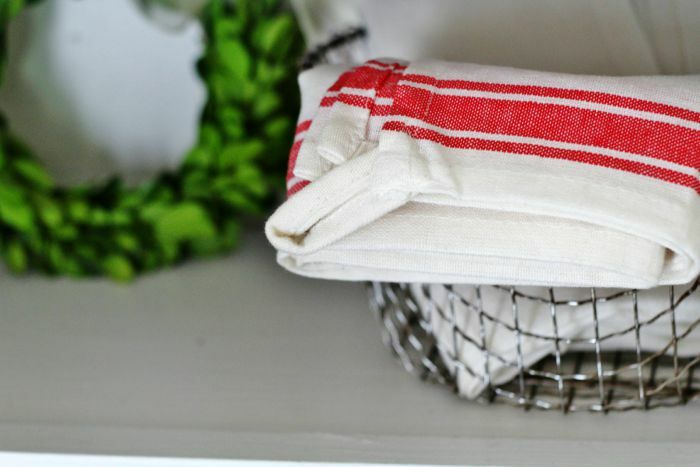 An old fryer basket holds my red stripe towels. 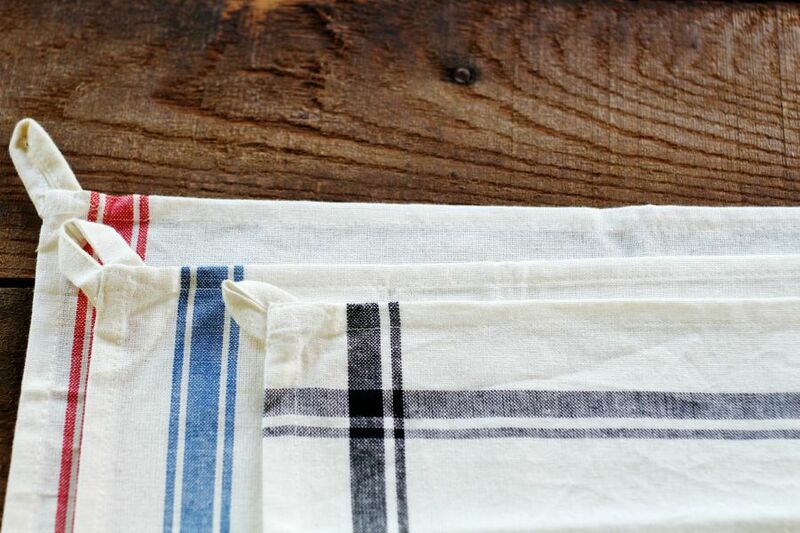 I now carry these towels in 3 colors in my shop – red, black and blue. Available HERE. 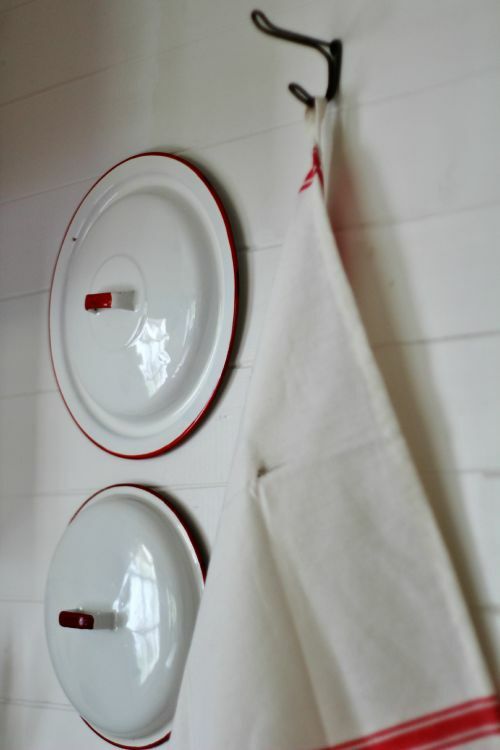 On the wall next to the cabinet I hung some old enamelware lids and a hook to hang a towel or apron on. Under the cabinet sits my antique kitchen stove. It belonged to my husband’s grandmother. His parents gifted it to me several years ago, and I treasure it. And can you guess what helped me decide how I wanted to decorate the cabinet? Yep… the little red chair I painted last week! I had no idea where I would use it when I painted it, but I loved it so much when it was done, I knew I had to make a place for it in my kitchen. and ended with my sweet little chair. You nailed it! I have one of those but in a floor standing column in my laundry room. You’ve inspired me to give it a makeover. 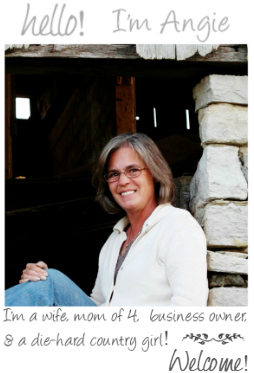 Beautiful, Angie! I love the combination of red, mint green and white. It looks so fresh and happy. It turned out great. It’s a beautiful transformation. I love all your pretty staging too. I had to smile though when I saw your pretty milk carton. 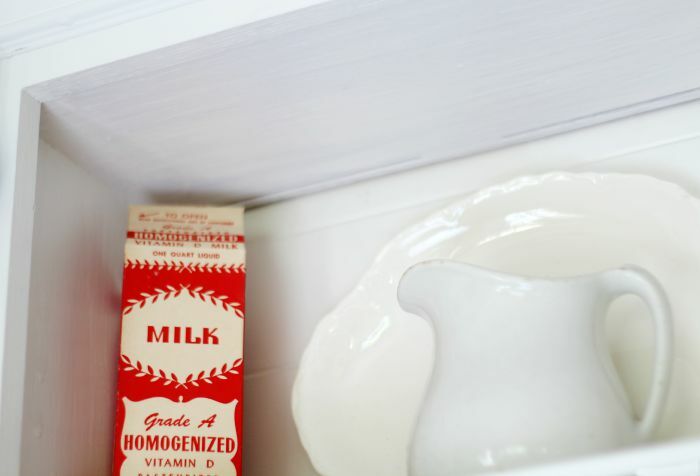 I’m guessing our grandmothers would have never thought a milk carton would be used as a decorative item in our kitchens. It’s perfect though. So very pretty, Angie! 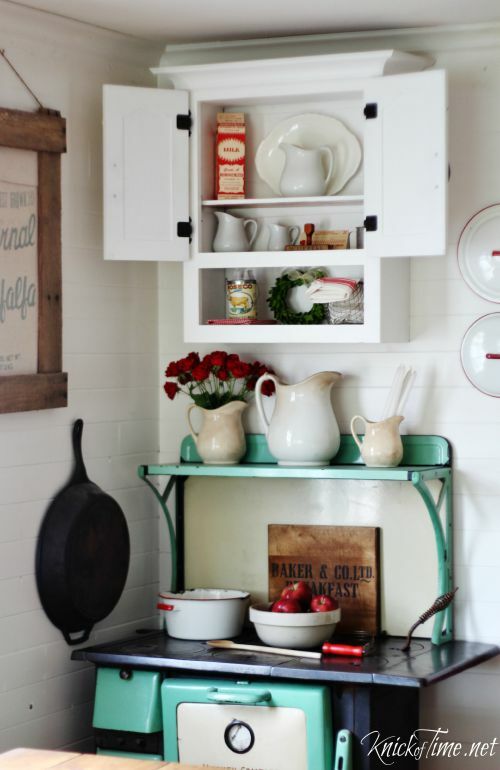 Love the cabinet and chair…but OH that stove…! Love everything about it! It all came together perfectly. This is one of those displays that when you walk in the kitchen makes you smile and gives you a warm feeling inside,or it would me. I love it Angie. So fun, how you incorporated all the bits of red to point to the best part … the sassy little chair. Love everything I’ve seen you (and hubby) have done. I have a collection of red kitchen items among which I have wax paper box, Argo starch, Presto divider, cake decorator and canning lids. 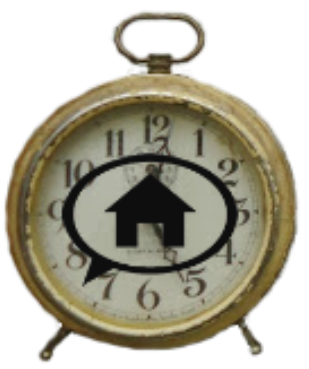 So much fun looking for and displaying old items. 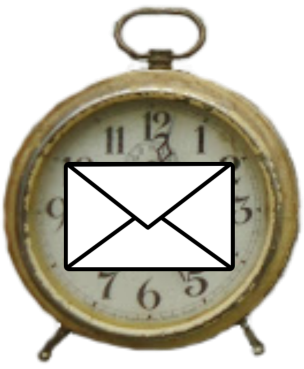 Look forward to your posts on my Email. Thank you! Completely lovely! Every piece of your kitchen is delightful. I would spend all my time in that cozy, charming room. What a difference some paint makes! Your old stove took me back to my childhood days at the lake. We had one outdoors and many a breakfast and percolated coffee was made on that old thing. 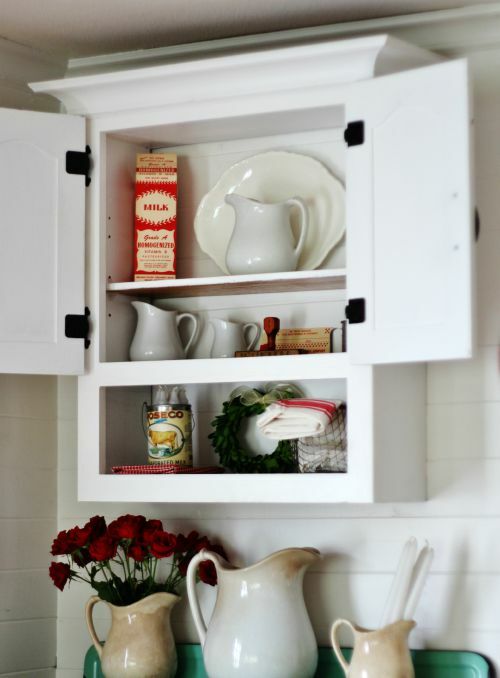 This is a wonderful makeover…there is no way you’d ever guess what this little cupboard started out life as! 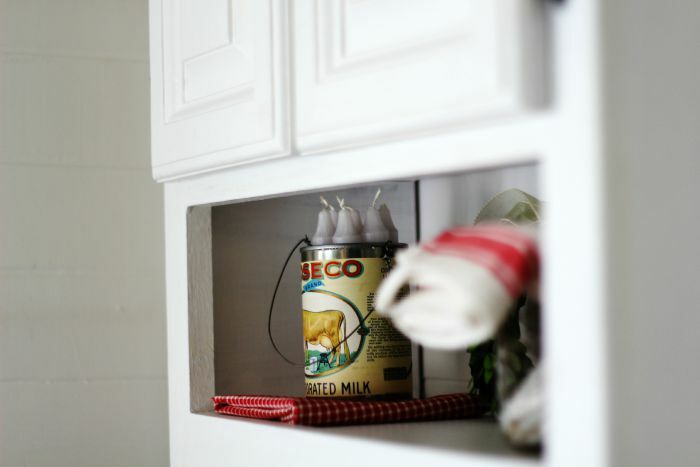 Adding the crown molding was genius…it gives it a much more attractive shape…and the hardware you chose really ties the cupboard in with your antique stove! 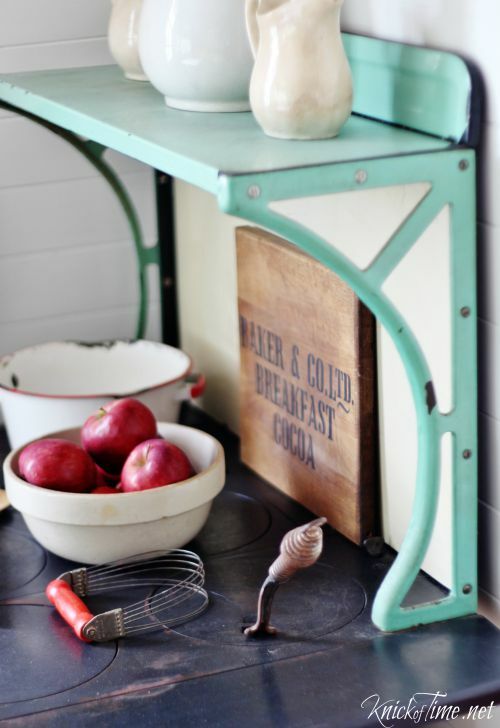 LOVE that stove to pieces by the way…oooooooh that gorgeous minty colour…but I digress! I also love the way you’ve styled it…what a gorgeous vignette this cupboard has created along with your stove and that sweet chair! This is one of my favourite pieces of your Creative genius. 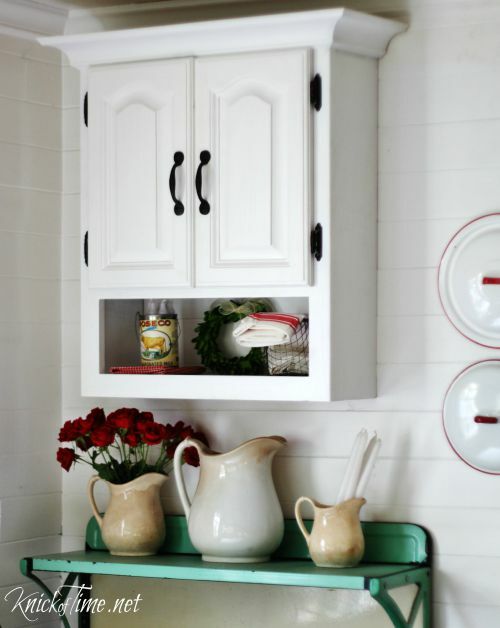 I really wondered how different you could have made the kitchen cabinet, and you really DID make it farmhouse-style!! 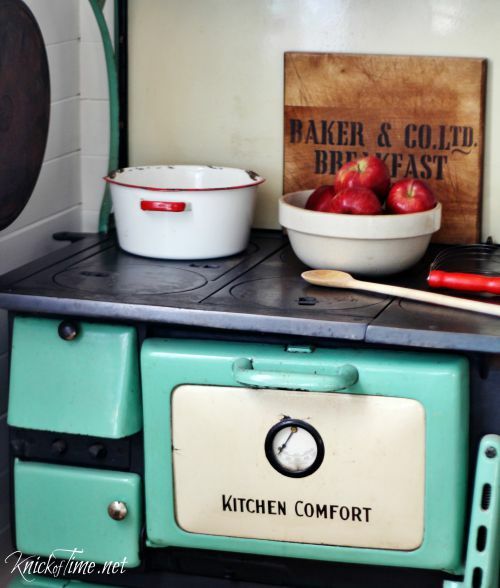 Love it, and the vignette inside, and adore the old stove – always wanted on. 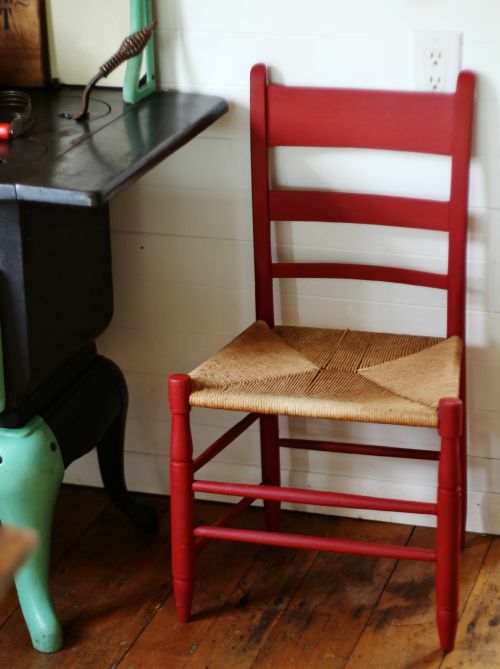 And the little red chair is precious – thanks for sharing!!!! From blah to beautiful, what an amazing transformation. 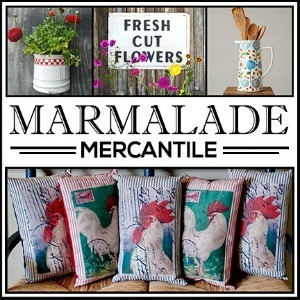 Love all your farmhouse goodies! Angie, it looks like a totally new piece of furniture. I guess hardware and a little paint makes all the difference. Also love that red chair!! Angie, the cabinet turned out darling! I love the added molding. 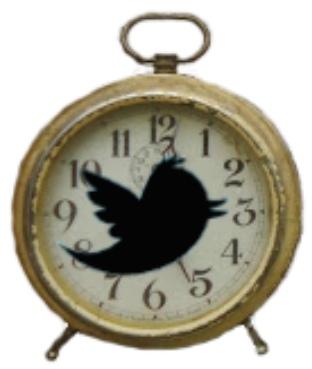 Totally upscaled it. You styled it so fun as well. 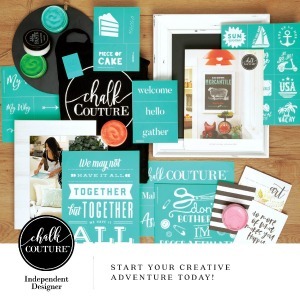 Love, love the milk carton and stamp! I have an old fryer basket that I pull out now and then. Cute with your sweet towels in it! Thanks for sharing with SYC. Hi Angie, just hopping back to let you know that I will be featuring you at SYC today. Wow!! 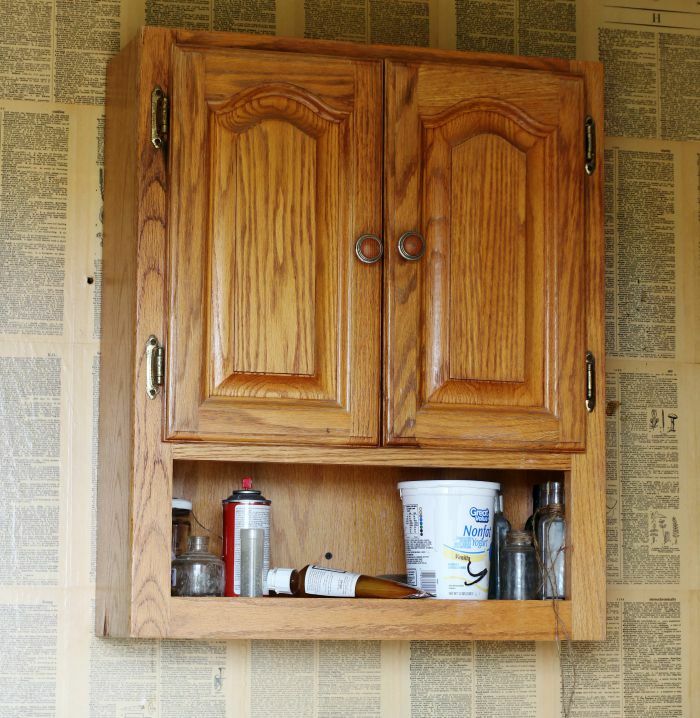 I would never have guessed that little cabinet/shelf started out life so ugly. 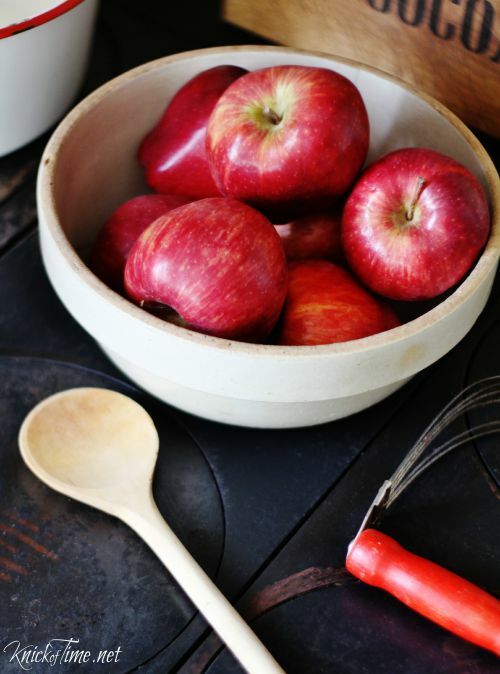 It looks so sweet in your kitchen now. I had an old stove in a house I lived in at one point in my life. It was gas and it worked -in fact, it was the only working stove or oven in the house. 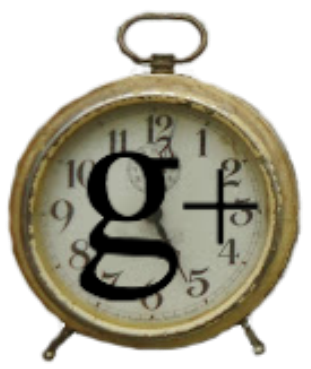 It was from the ’30s or 40s. I loved it and hated to part with it when I moved but I just couldn’t handle moving it to the new place. Angie, I think storage vs display is a constant battle for most of us ? Love what you’ve done! Hang on to it as long as you can!!! Love the creativity and it came out so beautifully! That exact cabinet is sitting in my garage waiting for me to decide what to do with it! Good job. Looks fantastic. 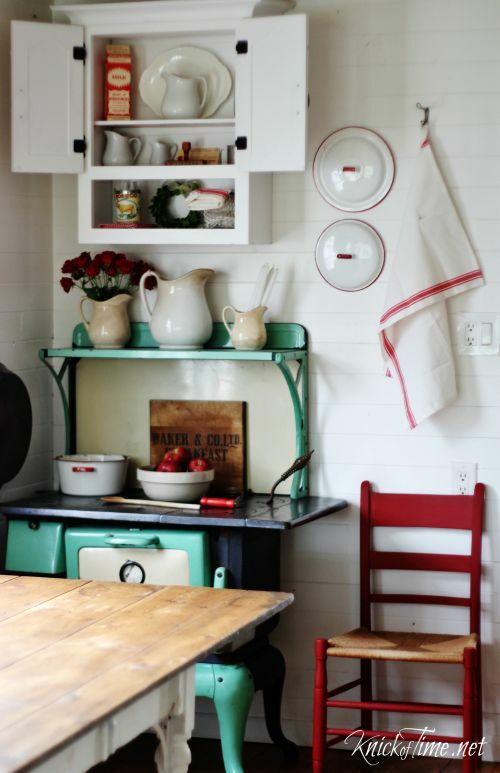 LOVE the stove & the red chair & accents.